For Mothers Day a couple of weekends ago I went on a little day trip with my parents to Leamington Spa in Warwickshire. I had visited the town briefly earlier this year, but as it was pouring down with rain I didn’t get to have a good look around, so I was looking forward to another trip. It’s an adorable little spa town that has plenty to see and do, and we found lots of cute little shops, restaurants and cafes to browse. 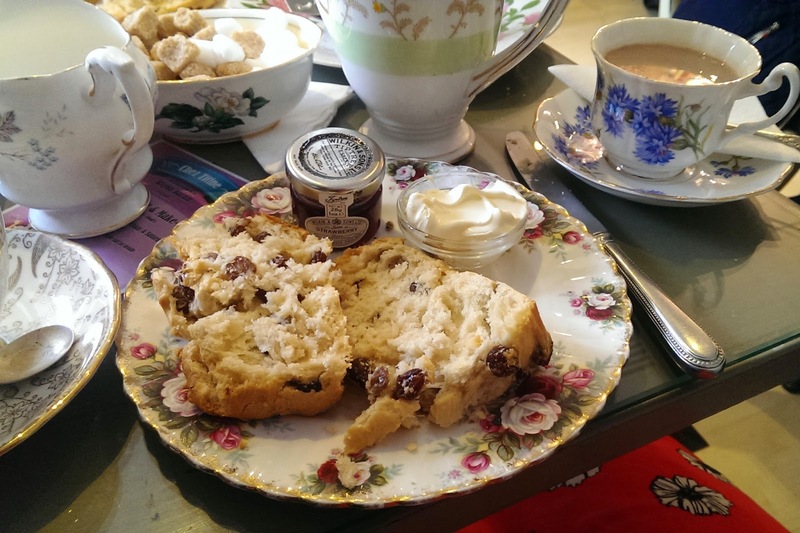 As it was Mothers Day I had planned to treat my parents to an afternoon tea at a little tea room called Vinteas which I had found online. It’s in the centre of the town, down a street with lots of little independent shops and behind the main shopping mall. 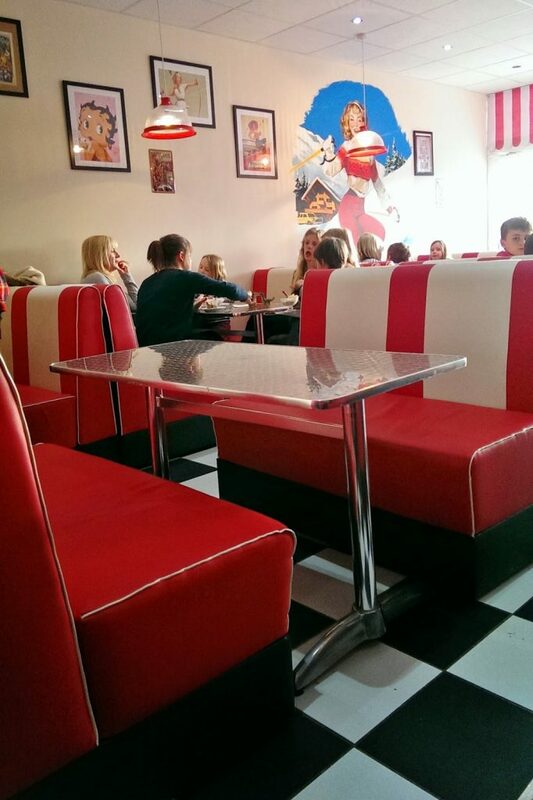 As it was a busy Saturday afternoon and we hadn’t pre-booked, I was hesitant that we may not be able to get a table. 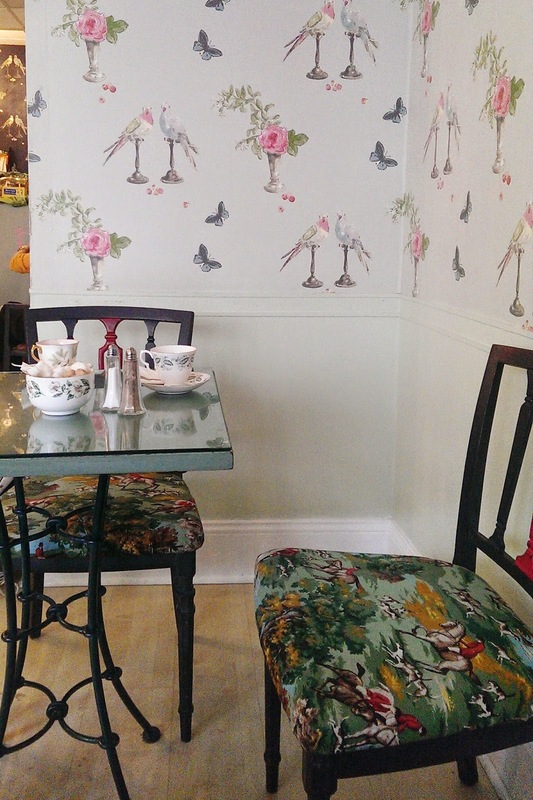 The tea room is quite small with only a few tables, and it seemed like a big table at the back was already reserved by an adorable group of little girls having a pink birthday tea party! However we very were lucky as there was a little table that could seat three people by the front of the tea room, and we sat by the window where we could watch everyone go by. 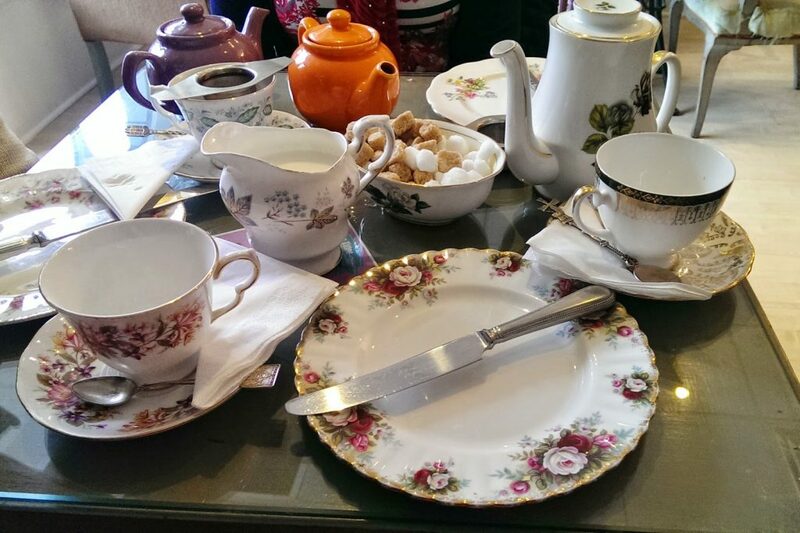 We decided to get two of the full Vinteas afternoon teas between the three of us, and each one included a pot of tea, a selection of finger sandwiches, mini quiches, a fruit scone with clotted cream and strawberry preserve, and a slice of cake. 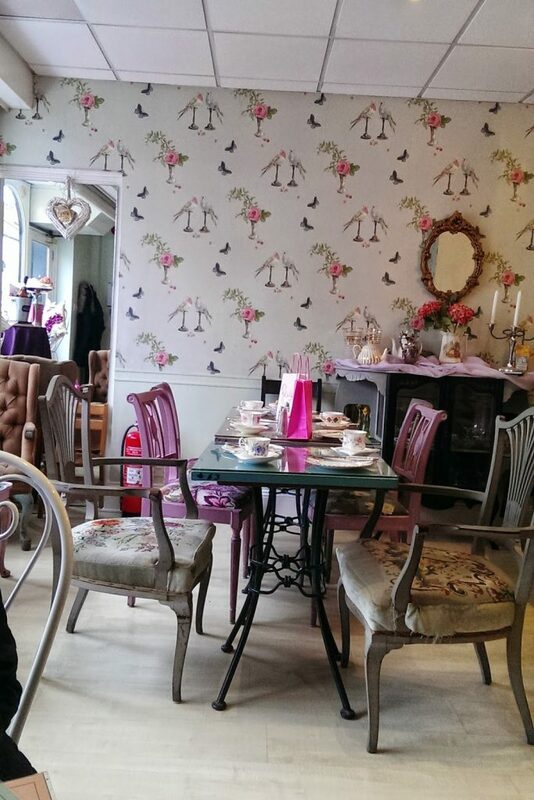 What appealed to me to visit this tea room is that all food is served on vintage crockery, drinks come in old teacups, and the whole place was beautifully decorated with pretty shabby chic decor. The sandwich selection included ham, salmon and cream cheese (my favourite! ), roast beef, and cheese and chutney. There were also delicious little cheese and onion mini quiches which were very yummy, and this was all brought out to us very quickly and on a vintage two tier cake stand. The delicious scones were homemade and warm, served with plenty of cream and jam. 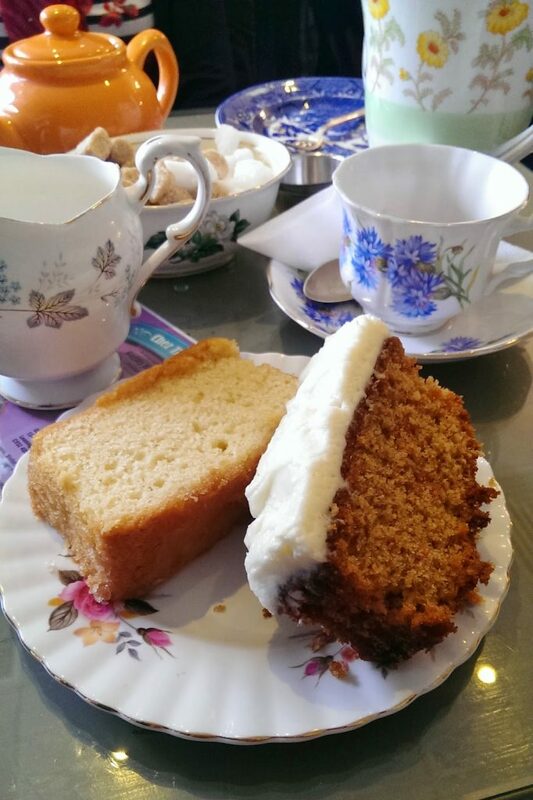 Finally, we were given the menu so we could chose our own slice of cake, and we picked a slice of carrot cake and a lemon drizzle cake, both of which were perfectly tasty, although not so pretty. The only down side to the meal was that I requested an additional hot chocolate, but when it arrived (in a very pretty teapot) it was extremely cold. However they did rectify this by bring me a new piping hot one right away, so I’m not sure what went wrong there! The staff were extremely busy, but they did keep coming over to check everything was okay and to tidy excess plates away. 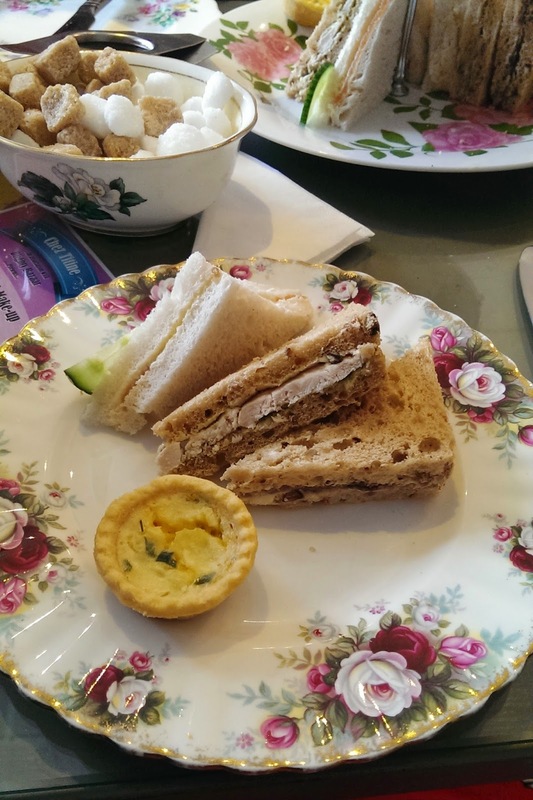 Overall we did have a very enjoyable afternoon tea at Vinteas and it was very reasonably priced, and a lovely treat for a special occasion. After our lunch we wandered around the shops on the high street, and then walked out a little bit further afield. 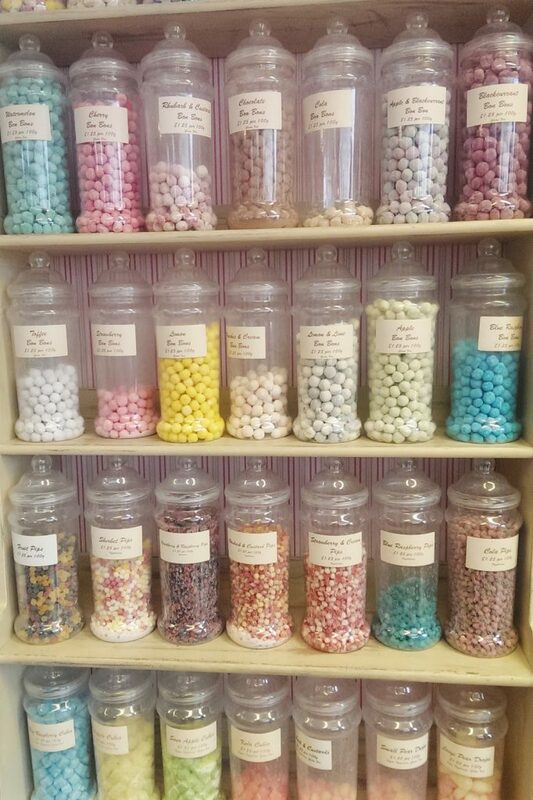 We came across a lovely little pastel coloured traditional sweet shop called Sweet Tayloula on Lantern Corner which was filled with all the good old sweets! The store was full of very excited kids spending their pocket money, and they also do some great looking milkshakes! The whole town was lovely, and we also found a little street full of charity shops which we spent a while browsing in. On our drive home, we saw signs posting towards Kenilworth, and I had heard of this little town before and the castle, so we took a little detour before home time. 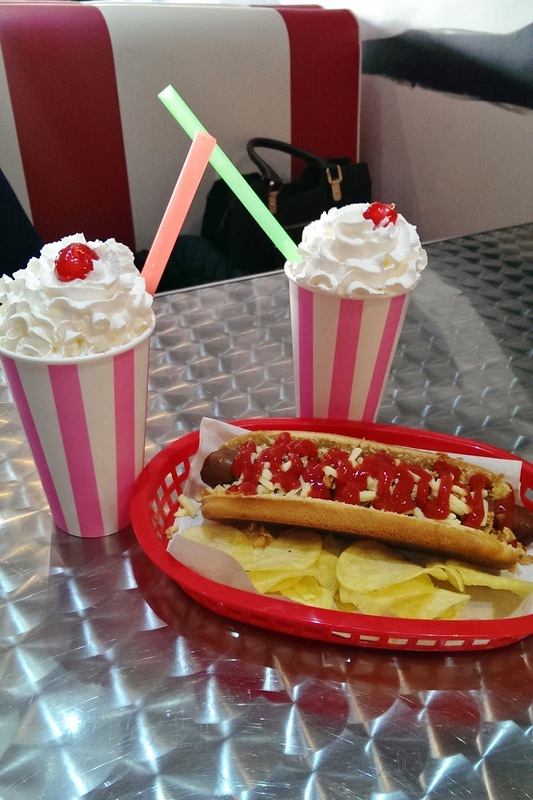 Again we had a little walk down the high street and had a look at the castle ruins, and we also stopped off for hot dogs and milkshakes at Lickety Lick ice cream parlour. 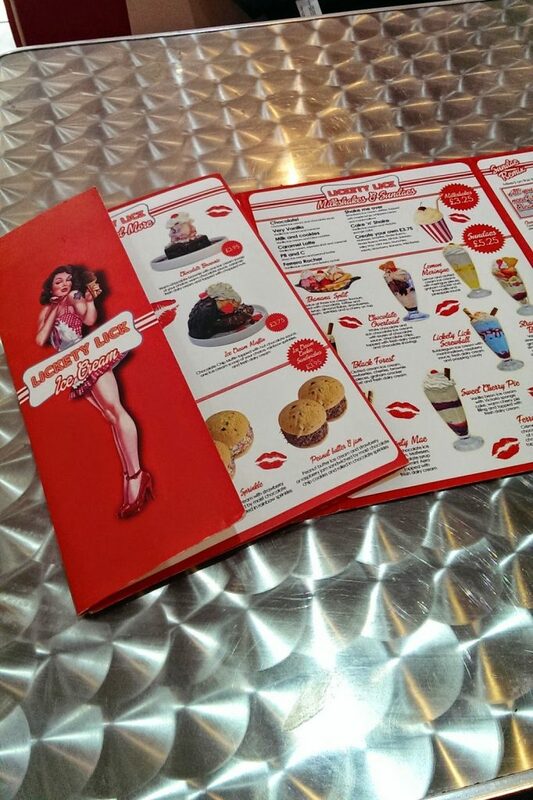 It’s a really nicely themed retro American diner, and we sat in a red leather booth and enjoyed our treats before finally heading home. 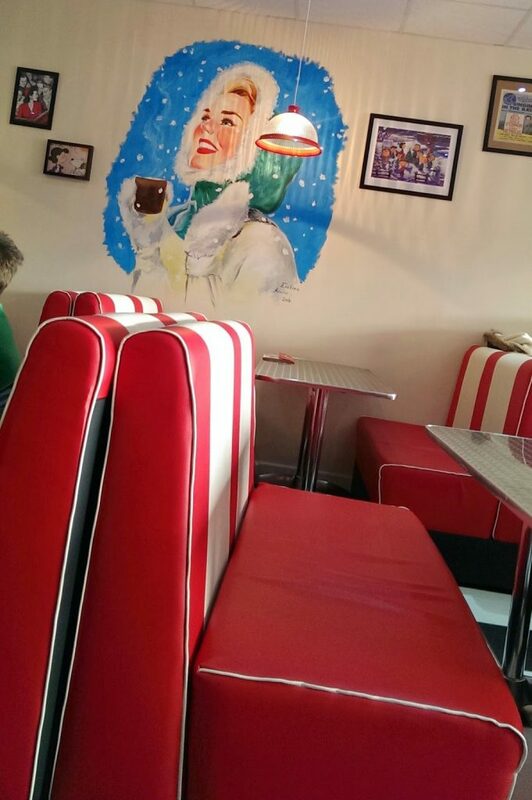 It was a lovely little place, although the milkshakes were mostly milk rather than thick ice cream, but they were cheap enough. 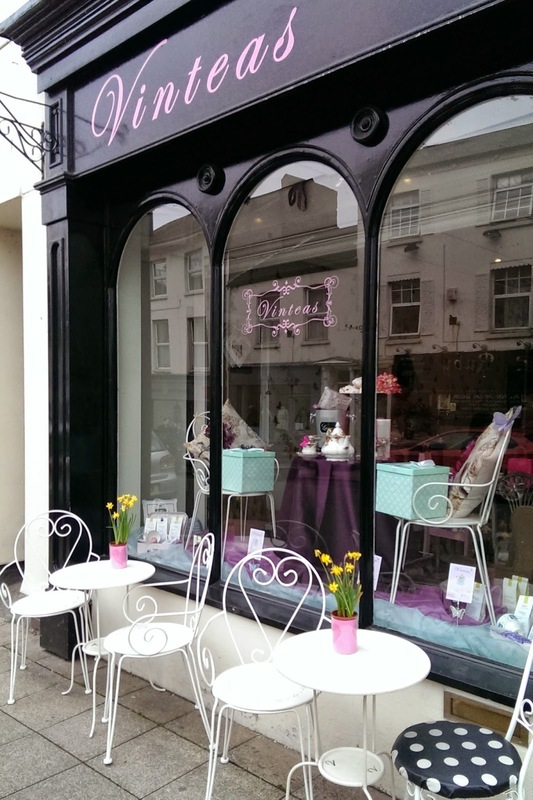 They also have parlours in Leamington town, Coventry and Birmingham too! We had a lovely day visiting Leamington and Kenilworth, and we hope to visit again in the summer when it’s a bit warmer to investigate more! Aw, I love Vintea's, although have only been a couple of times. Lovely post! I really need to get myself down to Vinteas seeing as I only live in Warwick! You blogg is so cute !! I just discovered it! 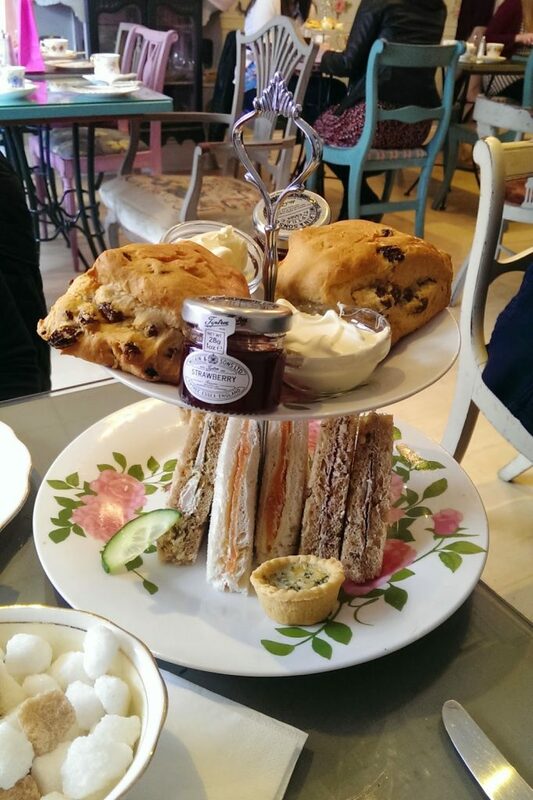 I love this type of post and I would love to try Vinteas afternoon tea. Beautiful picture too. PS: I am following you now.